Howdy, Gameologerinos. I’ve already told you about my trials and tribulations in the horrendous yet magnetic world of Bloodborne. After that ordeal, I needed to unwind with something a little more pleasant (which would be anything—outside of maybe Hotline Miami 2). Still in my Bloodborne stupor, I stumbled into a little $5 3DS puzzle game called BOXBOY!. It hails from HAL Laboratory, the studio most famous for giving Kirby to the world. While it can’t quite match that series’ cuteness, BOXBOY! has inherited plenty of its cousin’s charm. The key is simplicity. 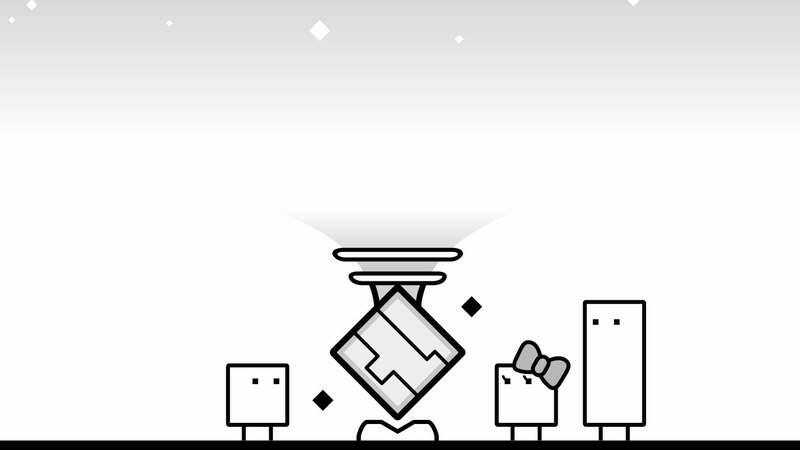 You play as a sentient square—just four lines, two legs, and a couple of dots for eyes—in a world made from nothing but black lines on a white background. To reach each stage’s exit, you’ll have to sprout some other squares and put them to good use: as stepstools to reach higher ledges, bridges over spiky pits, shields from deadly lasers, weights to hold down switches and open doors. I’m still pretty early on, but so far, the most fun application for those budded boxes is to emply them as a sort of Tetris-piece grappling hook. You can hang from your chains of squares and fling yourself from one end to the other, climbing up the side of a wall or snaking through a tight passage. From the looks of that trailer up there, though, that’s just the beginning. It takes a while for the puzzles to require much thought, but even when I was blowing through stages in seconds, BOXBOY! had me charmed. It’s a concentrated dollop of that Nintendo magic people love. The music is bubbly and catchy. The puzzles have a perfect rhythm where new ideas are introduced, put into practice, and pushed to their limit before another wrinkle is added to the mix. My favorite details might be the animation, though. Because the game is rendered so simply, every bit of emotion your character displays is comically pronounced, like the way its eyes and legs wig out when it falls on spikes or how it shakes and sprouts little angry eyes while it’s pooping out new blocks. I should’ve known Nintendo would have my back in these trying times.